This story comes from before the time of the Anishinaabeg, when there were only animals. The animals could understand each other back then, and worked and played together. Back then, Bear was different than today—he had a big, long, bushy tail that he was extremely proud of. One winter day, before hibernation, Bear was walking around a frozen lake, and saw Otter sitting next to a hole in the ice, with a huge pile of fish. Bear liked this idea a lot, and Otter left him at the fishing hole, giggling as he left. Bear sat with his big, bushy tail in the water for hours, wondering why he was such an unlucky fisherman. Finally, it was time to go home, and Bear sat up, ready to walk away. He was pulled back, however, and looked behind him, only to see that his big, bushy tail was frozen in the lake! He wriggled and pulled and pulled and wriggled until the finally tore his tail in half, and was free. 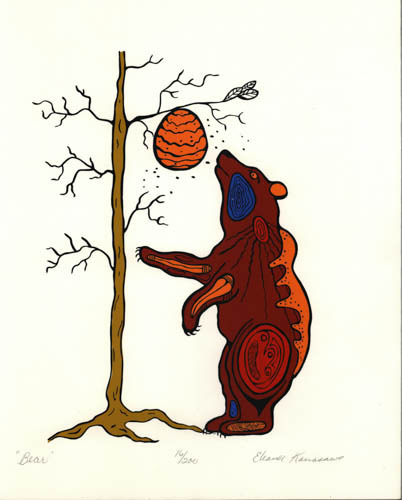 That is the story told by some Ojibwe of why Bear has such a stubby tail!